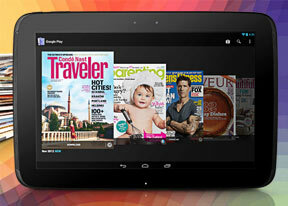 The Nexus 10 features a built-in GPS receiver that got a lock in about a minute. You can use A-GPS to speed that up or go for Cell-ID and Wi-Fi positioning for a rough lock (all three options however require an Internet connection), but the GLONASS support and the barometer allow it to get quick locks even offline. You just choose "Make available offline from the menu" and pan/zoom around until the desired area is in view (there's an indicator showing how much storage that area will take). You can later view cached areas and delete ones you no longer need. Google Earth came preinstalled on the Nexus 10. It's like a 3D version of Google Maps (well, except for the navigation bits). People interested in geography will appreciate Earth as it's much better at showing terrain, but it's not very useful for getting around a city like Maps is (e.g. finding a nearby cafe or navigating to an address). The Play Store has several scrollable tabs - categories, featured, top paid, top free, top grossing, top new paid, top new free and trending. It hooks into your Google Plus info and will recommend apps based on what your friends like, but also based on what other people like, even if they're not in your circles, but have installed the same apps as you. When downloading an application, you get useful info on the app, like rating and comments along with the info, screenshots and demo videos by the developers. Before confirming the download, the Market will show you a list of permissions required. The Play Store features much more than apps - you can also buy (or rent) movies, TV shows, magazines and books. You can even charge those to your phone bill rather than your credit card (it works only on some operators, in some countries).